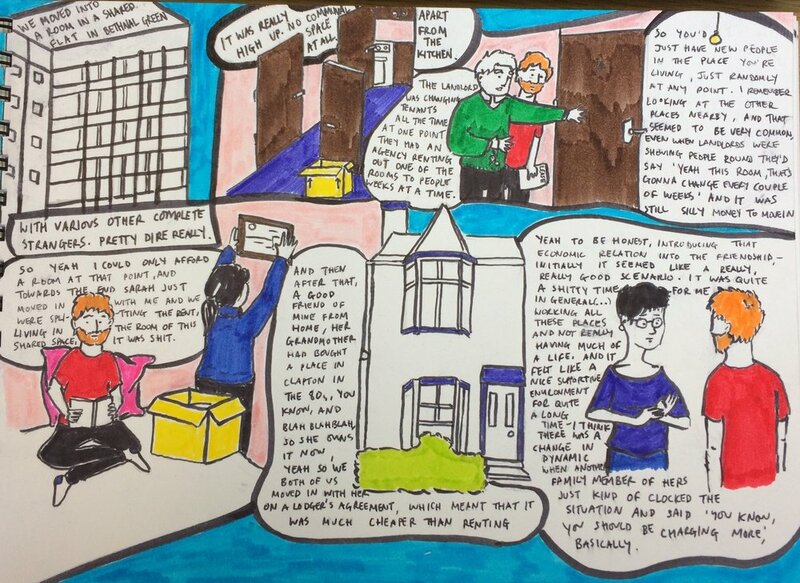 My PhD research explores the ways that economic constraints affect social reproduction among young people living in rented accommodation in Hackney. I use the term social reproduction to mean the labour that goes into reproducing everyday life, with a primary focus on the work of maintaining and reproducing relationships: friendships, family relationships, partnerships. This is part of my theoretical attempt to expand an understanding of intimacy, reproduction, and political economy to include a broader spectrum of relatedness and labour. I'm using visual methods by illustrating excerpts of interview transcripts. This is something I am going to compile and disseminate in conjunction with producing my thesis.